Welcome to crowd-sourced resume review for LIS job hunters! 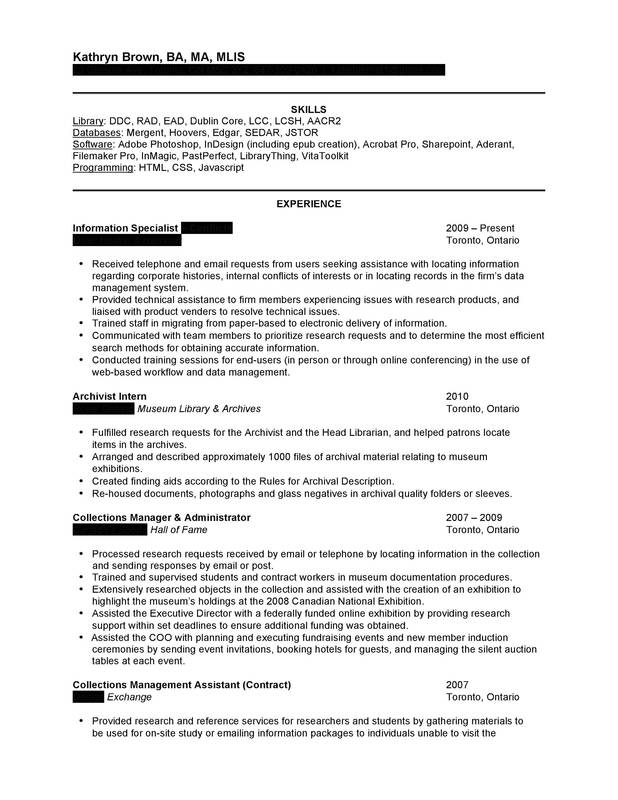 Please help the job hunter below by using the comment button to offer constructive criticism on her resume. Some guidelines for constructive feedback are here, and the ALA NMRT has brief tips for reviewing resumes here. 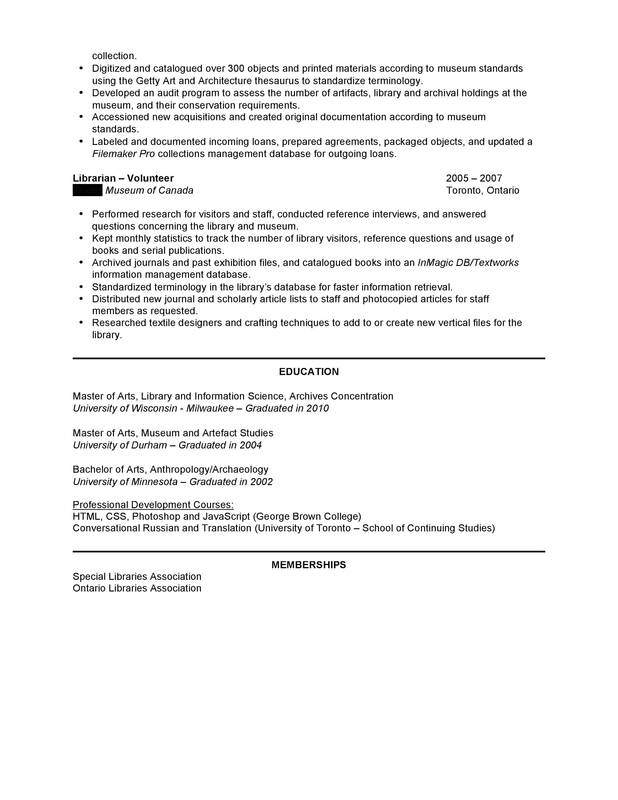 This resume is being used for a part-time contract position at a public library. I am assuming it is an entry level position. I don’t have a ton of experience in an actual library but I’ve tried to play up the customer service aspects in my previous jobs to show my skills are transferrable. send it as a Word document, PDF, PNG or JPEG to hiringlibrariansresumereviewATgmail. It will be posted as-is, so please remove any information that you are not comfortable having publically available (I suggest removing your address and phone number at a minimum). describing the types of positions you’re using it for (ie institution type, position level, general focus). Finally, you will also need to confirm that you agree to comment on at least five other posted resumes. For the sake of consistency I would suggest that you add dates for your professional development courses and your association memberships. I would also recommend changing the date formatting on your degrees so it matches the style of dates that you’re using for your work experience; also for the sake of consistency. You might even consider moving the professional development courses from education to the same category as your association memberships and relabeling the section something like “Professional Involvement”. These are all changes that have worked for me in the past. It might be worth rewording some of your bullet points to be more active. For example, “Fulfilled research requests” is a bit vague. Did you use ILL? Did you give database tutorials? Explain! Think about moving your education to the top of your CV. Use the skills you have listed to flesh out your professional experience. Something we find handy is to put the requirements of the job ad into separate bullet points and match the candidates’ experience and skills to the position. Basically we create a checklist. For example, one of the bullet points of the job ad stated – “understanding and appreciation…public service” – using that incorporate your skills into the professional experience to show you have had some public service (interaction with library users) experience. -Sort of plain looking. In my opinion, you need to visually stick out a little. -Lead with education of experience (probably education) and leave skills until the end. -Do you have any output that would show off your skills? Digital projects you could provide links to/online portfolio? -When it comes to bullet points, my general rule of thumb is no more than four. I have no real basis for why, but it just works for me. It looks like most of your skills aren’t relevant to the reference and collection development focused job you’re applying for. Can you replace them with more applicable skills? Even if you know you’re good at recommending books from helping friends, it might be worth putting there. Just be ready to back it up at the interview. What I like to do is pick out the required skills in the job listing and put as many of them as I can justify front and center in my skill section and make sure they’re all mentioned in my cover letter. Back that up in the job duties where you can too. I assume the second qualification point can translate to “works well with diverse populations.” If you speak a second language (French, Spanish, First Nations languages, etc.) and have experience working with non-English-speaking groups, you should mention this. I usually do not see skills sections unless you are getting a technical job, such as programmer. I agree with Lauren that it should be removed and only weave in those skills relevant to the position into the bullet points. You appear to have a great combination of skills and experience that can be translated to a public library environment. However, because you have yet to obtain an opportunity in that setting, it might benefit you to split your work experience into positions that directly and secondarily relate to public librarianship. If you decide to do so, I suggest reducing the number of bullet points for those positions that may be considered secondary (e.g., Archivist Intern and Collections Manager & Administrator). If you take this path, you’ll also want to effectively demonstrate that the work you’ve done in related settings (e.g., Information Specialist, Volunteer Librarian) closely matches the type of responsibilities you’ll hold at the public library. For example, you indicate that you “Received telephone and email requests from users…” Was this a reference or research-based service? If so, state that. Much of the work in which you’ll be engaged in the public library is probably reference or research based. Consider following that example to ensure that your experience aligns with and clearly indicates the qualifications required of the position.